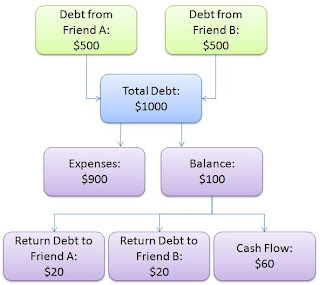 To simply answer the two questions, you can use a cash flow diagram to help you. $920(in debt) + $40(you have left) = $960. So where is the missing $40? Total debt left = $920 - $40 = $880 which is equals to your expenses. This formula uses minus instead of plus. Where does the extra $20 come from? Total debt left = $960 - $60 = $900 which is equals to your expenses. This formula uses minus instead of plus. Total debt left = $960 - $60 = $1000 which is equals to your expenses. Thank for pointing out the error. Why I wanted to achieve Financial Freedom? Plan for your retirement as early as possible.